Failure University (officially abbreviated FU, with sincerest regrets) is a fully self-accredited coeducational Internet-based university. Founded in 2006, it endeavours to provide advanced degrees to the mentally and financially underprivileged — namely those persons who were too dim to be matriculated by a standard college or university, and whose parents were too poor to build a new engineering building or add a wing to the campus library. The university's professional graduate schools offer degrees in the fields of information science, law, medicine, business, engineering, public policy, and education. These are consistently not ranked by US News & World Report in the Top 10 programs in the United States, nor in the Top 1000 worldwide. However, the school is proud to report that the degrees themselves are regarded as some of the most authentic and attractive looking of those seen anywhere. in MP3 format. Read by the author. Prospective students must establish that they meet the criteria for intellectual and economic poverty. Acceptable documentation is usually comprised of failing transcripts, involuntary withdrawal notifications, or expulsion letters. Those persons not having ever attended a college or university can provide proof of equivalent stupidity, naiveté, poor judgment, or laziness by submitting a work portfolio detailing a minimum of 5 years of experience in the fast food industry. Based on previous intake data, the most successful candidates should provide pictures establishing that they (a.) know the correct grip to use around a spatula, (b.) can properly tether a protective apron, and (c.) can wear a paper hat convincingly. Credits of advanced standing, bursaries and other financial aid are usually given to those who submit electronic or videotaped demonstrations of themselves deftly avoiding the exploding pop of searing hamburger grease, and the fetid spittle of angry customers. Naturally, letters of recommendation, in the form of customer comment cards about the quality of food, service, or restroom cleanliness can only improve the odds of being selected. FU operates on the principles of "Each one teach one", "help thy neighbour", and other well-established bits of popular folk wisdom that promote cohesiveness and community, while eliminating the need for costly instructional staff. To assist you in your new role of Student-Professor, you will be e-mailed detailed instructions outlining how and where you can obtain the textbooks, exams, computers, and stationery for your upcoming term. Usually, these are stored in the various departments of colleges and universities in your area, which we refer to as our partner organizations. If you are ever stopped by their faculty or security personnel and asked where you are taking the materials, be sure to respond: "F.U." Our tests are designed to meet your personal need to feel challenged, without being too intellectually taxing. This, in tandem with our belief that "there is no one right answer" and our generous grading curve allows us a near 100% passing rate. BEAT001 Pop Music Appreciation Spanning everything from The Beatles to Death Cab for Cajek, someone's bound to like what you like, even if it's complete garbage, like country, folk music, or wigger rap. EROT001 Art Appreciation Enjoy free galleries on the Internet, and share your findings with others. WARNING: Most classes focus on "erotica" in the modern age. Do not "study" at Internet cafes or other public terminals. SURF001 Surfing Learn to cutback, duck dive, hang ten and tube ride. Or, just learn what the words mean so you can pick up chicks while you obsessively wax an expensive board you never actually use. RVID001 Retro Video Gaming Why Atari 2600, Intellivision, ColecoVision and NES totally rock. Also: why you're unemployed and friendless. GANJ001 Hydroponics Cultivate your own herbs and other alternative medicines at home for fun and profit. Are you pissed off at your Internet Service Provider for throttling your download speed? What about those cheap asses at the utility company who cut off your water supply for completely frivolous and nonsensical made-up reasons, like "unacceptable payment history"? Frick me, what's a few thousand dollars to some powerful monopoly corporation? I can show you how to right these corporate wrongs from the comfort of... like, wherever it is you're crashing at the moment (not judging here). SIGN UP NOW!!!!!!!!!!!!!!! SPACE IS LTD.
Then, feel free to sign up for as many courses offered by other students as you wish. You can even give yourself credit for attending your own course! Our principle of reciprocal learning is based on the axiom that the human race contains the sum of human knowledge and skill, therefore any subset of that whole must contain a proportion of that knowledge and skill. Even within a group of idiots there exists vast knowledge, and even among failures there exists great strength. Probably. Studies have proven it. If you're flexible, excellent accommodations can be found in any price range. 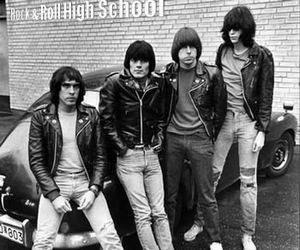 Members of Gamma Gamma Eta arrive to speak to future FU students at Rock & Roll High School, Queens, NY. FU prides itself on using its research endowments to validate the studies which underly its own instructional model. Additionally, additional studies are being studied in-house that validate the validity of doing studies about the validity of in-house studies. These are repeated yearly, on an annual basis to establish replicability. Identical findings have been produced each year that establish both the validity of FU's instructional model, and the replicability of the study methodology and findings— which are identical. Collectively, these comprise individual steps of what will eventually become a longitudinal study of the university, its teaching methods, and its research methods, but early projections indicate that no contradictory findings will be found. As FU is not a brick and mortar institution, no student residences are provided. During temperate weather, bridges, apartment canopies and fire escapes provide adequate shelter, though the more nomadic and adventuresome student may appreciate the flexibility and portability of an appliance box. 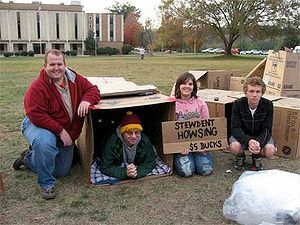 For autumn and winter attendees, FU recommends friends and relatives as an excellent source of housing for low to no cost. FU highly encourages its students to avail themselves of public library facilities in their local area. These provide the Internet access, clean washrooms, and comfortable chairs which our students have come to expect of an institution of this magnitude. The university has no sports teams per se, so for those with a special interest in athletics the administration wishes to remind you that it is reasonably simple to attend basketball, football and baseball games by switching on a nearby television. FU's sole fraternity is Gamma Gamma Eta (ΓΓΗ). Students wishing to pledge must love punk, but not know to play an instrument. Uniforms are mandatory, and available for purchase at most Value Village and Salvation Army stores. There are no other rules, but anyone caught sleeping with the President's girlfriend will be shunned, then complained about in a song in lieu of expulsion. In order to promote the desired mix of creativity, frugality and industry that distinguish our graduates, the final assignment of each student is to create their own degree. Certainly, you could pay some alleged faculty headquartered out of a cheap motel to manufacture and send you a pre-printed degree, but what would you learn from the experience? Only further confirmation that you're stupid enough to approve your own tuition hikes. Instead, you should produce your own third-party-accredited, self-conferred degree by following this simple tutorial. Try this at home. It really works! Use your favourite search engine to find pictures of other people's degrees on-line. You'd be amazed by how many pretentious twits will scan in their sheepskin to post on their website as an electronic equivalent of a schoolyard "Nyah nyah, nyah nyah nyah". 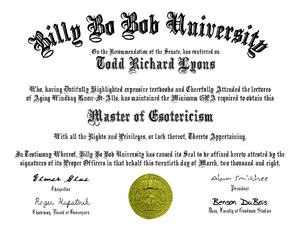 For your convenience, here is some anonymous jerk's actual degree unwittingly uploaded just so you could make a carbon copy of it for yourself without paying the tens of thousands of dollars for it that he had to. Who's the smarty now? Adjust the page margins and set the orientation to 'landscape'. Some universities, like Harverd, have degrees printed using portrait orientation, but they're a minority. Besides, FU's administration has it on good authority that portrait-style degrees are more likely to be accused of being fake. Select a fancy Old English style font. If you don't have a good font installed search on-line for free fonts. Keep in mind that the importance of Old English font is not merely for aesthetic purposes, it's tiring to read — and that's a good thing! Using that frilly, tangled text in the traditional layout instantly signals to potential readers what the document is, thereby saving them the trouble of actually having to read it. Even the most stoic of employers will see "University of Tuktoyaktuk", allow their eyes to drift down to find your name, then sigh with relief knowing they can safely ignore all the scholarly psychobabble in small print. Notice the example degree to the right; a nice curved name at the top looks most impressive. In OpenOffice, you can create a fancy 'Fontwork' arc by selecting: Format > Object > Fontwork. While FU heartily recommends that you emblazon your degree with Failure University across the top, no one will blame you if you do otherwise. Blatantly copy the text from the degree you downloaded earlier. Start with the name of the institution. (Truthfully, no one at FU headquarters will look at it to notice. Call it the "honour system" if it makes you feel better than being cheated or merely ignored.) Plus, there really is no substitute for a Doctor of Laws from Harverd, or a Master of Locksmithing from Yale. And you're done. With only a few dollars invested in thick, quality paper for your final print, you may expect to reap an instant $25,000 to $75,000 raise. Go ahead and get yourself one of those fancy square caps in your favourite colour if you like. For those without comedic tastes, the self-proclaimed experts at Wikipedia have an article about Laura Callahan. Laura Callahan from a virtual unknown to a senior information technology manager at the White House, the Deputy Chief Information Officer of the United States Department of Labor, and a senior director at the US Department of Homeland Security. It's all true. Something in this article had to be. I'd like to begin today by offering my warmest, most heartfelt condolences to you, the doles ... or, rather, my sincerest congratulations to you, the grads of 2019. When I look out at all your smiling faces... or, rather, what I imagine to be smiling faces, given that this comes by way of mass e-mail... I am deeply moved by your distinct individuality. Individuality is the key to success. And while elsewhere there are dozens of hundreds of students sitting in actual auditoriums dressed in identical caps and gowns, it is my pleasure to imagine you, the class of 2019, sitting there in your fading concert T-shirts and stained underpants, skimming every 5th or 7th word I've written, while you wait for your celebratory microwave banquet dinner to thaw. Now, in your future career, as in life, you'll find... ''''' ...Ah, well I see my minute is up. Best wishes, and do enjoy the peach cobbler. Not too quickly, mind you, the steam under that plastic is hot.